Sharon Boggon is a fiber artist living in Australia. Her work has been exhibited throughout Australia and resides in numerous private collections. She maintains the online community Stitchin Fingers and teaches several online classes in a variety of subjects including Studio Journals: A Designers Workhorse, Gimp for Textile Designers as well as classes in hand embroidery and crazy quilting. 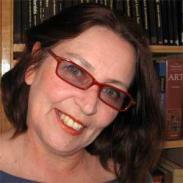 She holds a Masters of Arts (Visual Arts), from Australia National University and currently works at the Computer Arts Studio at the School of Art, which is part of theAustralian National University. 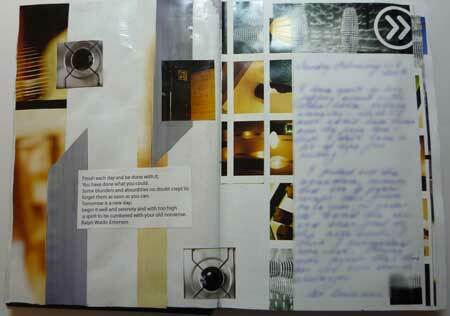 I have a studio journal that I aim to work in 2- 3 times a week but that does not always happen. I also keep a personal journal that I write in daily and have done so, consistently for over 20 years. I keep a studio journal because it is part of my design process. I also use the computer to produce designs but although lots of interesting images are created on a computer that develop along unanticipated and exciting ways, when you work in a sketch book the pace and process produces different work. It is not an either or situation as one can supplement the other, combining both processes that can really enhance skills. A studio journal can have another function an that is to be a place to record all the bits and pieces of your creative life and let it compost down into something that becomes a resource for meaningful work. I have even used a studio journal as a swatch book as it is one way of recording not only where things come from but what influences you. All sorts of things end up in my journal and I see it is all part of the process. I keep a studio journal and a personal journal. 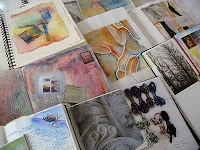 The studio journal is just that - what goes on in the studio and it is the space where I work out designs. It is very much a workhorse for me. I dont spend a lot of time creating a pretty journal I just work out what I need to in my sketch book and get on with it. I keep promising myself that one day I will make a journal that is less about working something out and more of an art object but I never get around to it. I also keep a personal journal. Although the personal journal has lots of writing in it just about every page has some sort of doodle or collaged item on it. Sometimes I do full collages and sketches in it too. I always choose a notebook that can take wet media just in case. I have tried combining them both but it does not work as I often hand out my journals in a class situation. If they have personal material in them I feel hesitant to share. When ever I have tried to combined them I start to feel constricted and as if someone is overlooking my shoulder. So I don't do it and just keep a studio journal that I dont mind sharing and is possibly the most interesting to people and one that is private. What's your preferred format (sketchbook size, type of paper, single sheet,spiral bound etc?) and preferred medium for using in your sketchbook? watercolor, pen, pencil, crayon, collage etc? 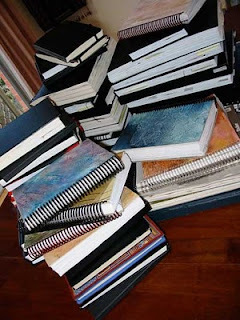 Sketchbooks range in size depending upon how life is tracking. If I am really busy I have a small one that can fit into my handbag and I carry around so that I can catch moments. If life allows I have a large A4 bound book that I love using in my studio. Other times (such as when I know I will travel) I choose a spring bound artists notebook as these allow lots of stuff to be pasted in without breaking the spine. I always choose something with substantial paper as this allows me to use different media. Sometimes I bind my own journals and lately I have been experimenting with binding mixed papers of mixed sizes into the one notebook. I have also played around with having fold out pages, envelopes, pockets, scrap paper of different sizes etc bound into the journal. These formats are fun and I can see these developing and perhaps even shaping my journal into something else. It changes. To be honest I don't think in terms of using a favourite medium. To me that is like saying what is your favourite fabric. I may like silk, but I am not about to try and cover an out door chair in it. 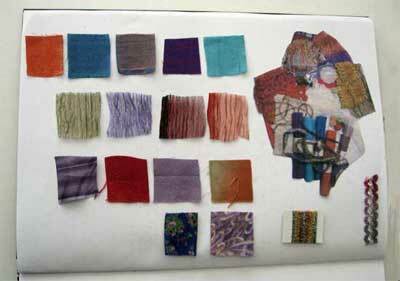 I would choose a fabric that suits the task and wear it will get. It is the same with art mediums. I use them all as I need them. It really depends upon what I want to achieve. Perhaps the one product I could not live without is gesso. Just do it. What have you got to lose? A notebook and some art materials that is all. You have everything to gain as you are learning something. Thank you so much for this insight and information. Your site is PACKED with interesting and useful stuff! Thought I'm mostly a collage/paint artist, I LOVE textiles, and your crazy quilts make me want to get out the threads and beads. I also keep a personal, mostly written, journal as well as a sketchbook. The journal NEVER gets shared, and it is where many ideas get developed at least verbally. 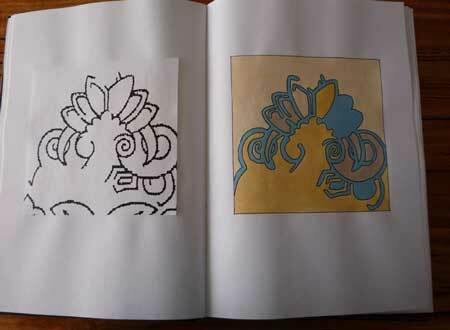 It is as necessary to my creative process as the sketchbook. Thanks for sharing! Wow, and I thought I had a lot of journals:-/ That is so awesome. Thanks for sharing with us. years - very sloppy but useful. Now my husband seeing me to do the workhorse started one too, ha, ha (about looking and maybe buying a house - you have to look at many of them and mix them all up). Lovely to work with you! Everyone is learning to draw!